I changed my imaging plans (as I often do) and imaged M5 instead of M82. I'd have more time on target that way. As it ended up, I had 105m unbinned L, and 40m binned 2x2 of R, G, and B. These were about the longest I wanted to go with the C925 operating at f/10. I'm still having issues with the image--the sensor plane is not perpendicular to the optical axis. Possibly this happened at the coupling, or potentially much worse is an issue with the secondary mirror. Coma-like stars aside the big issue was the sky brightness. Once again the limiting magnitude was awful, something like 3.5. Another ongoing issue is the poor showing of blue and the color balance in general. (Note the pink star at left and the blue-green one to the right.) 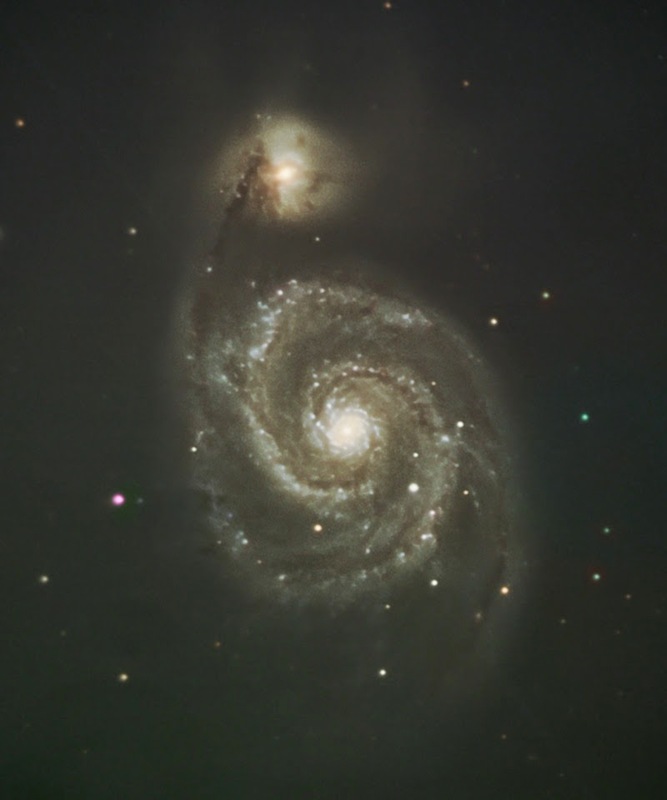 I'm going to be a bit of a purist and suggest that many imagers oversaturate M51 to make the arms a vibrant blue. Something between what they do and what you see above would be more to my taste. This weekend I hope to return to ALBN imaging, but as the day has progressed the weather forecast has deteriorated. If it clouds out I'll have a chance to clean my optics and work on my binocular holder. Almost time to send in my registration for the Two Rivers Spring Star Party! Leo I First Attempt; LBN 1089?